Have you ever gone through a season, challenging or joyful, and realized at the end of it that it was what you had prayed for? Or asked God to change something about you and He does it in a way you weren’t expecting? If yes to either of those questions, I can relate to you. Big time. I read Evelyn Christianson’s book of the same title and was deeply convicted about how I prayerfully approach and handle situations. The different between spending great amounts of praying energy asking God to change someone else’s behavior or tendencies and looking inward is vast. I grew in this way of praying (after lots of time and practicing) and I’m grateful for it. It’s actually been a beautifier of inner chaos instead of adding to the mess. For example, when it comes to my sister, I used to wrestle with God over how she wasn’t super talkative with me, wouldn’t open up a lot, but it became a burden that was tiring, and hurting our friendship. Thanks to Holy Spirit I then began to pray, Okay, God, change me. Change my perspective, to see her through Your eyes, how You wired her. Change the way I put unnecessary pressure on our relationship. Change me, help me trust that You are working in our midst. And I found it was a little easier to trust Him with the situation as a whole because I could see progress in me, believing He had good plans for our future friendship. Now we’re in a great place and it is a gift from Him. All grace upon grace. 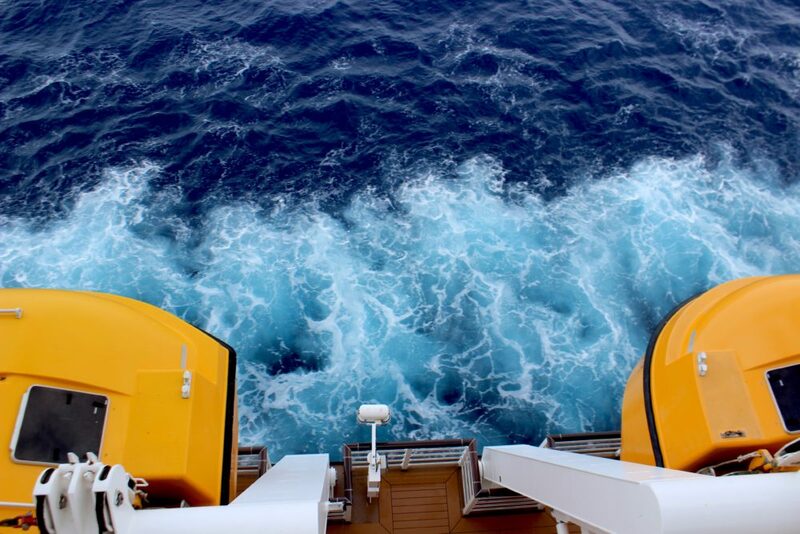 One of our favorite things to do while cruising this week was standing on the balcony and watching the open water. As far as the eye could see, water sloshing against water, waves crashing at the ship’s edge, open sea changing shape and continually moving. At one point in the week I thought, my insides feel a little like the ocean sometimes. Chaotic. Beautiful. Deep. Rushing. Drowning. Raging. I am passionate (a lovely word for emotional) person. Here I don’t mean cry often. Here I mean deep feeler. Here I mean tend to be driven and ignited by feelings. Here I mean experience life deeply. Here I mean even struggle to not bear the weight of someone else’s burden when it’s not mine to carry. I once heard someone talking about Jesus, commenting on his fully man-ness yet fully God-ness. Jesus experienced the complete weight of human emotion without sinning because He never let any emotion separate Him from His Father. Soul overwhelmed with the deepest sorrow imaginable, yet processing with Father. Jesus modeled perfect trust. He modeled real vulnerability in life’s circumstances, yet felt it with(in) his Father’s heart. Thanksgiving week this year was full. Full of family, laughter, conversations, shooting guns, being outside, delicious food, a few tears, lots of grace. I was driving out to my parents’ house asking Father for help. God, please give me wisdom and discernment in my choices. Bless our families with good quality time and rich conversation. Be honored by our words and actions and thoughts. In His goodness, He gave me a visual. Two sisters, different personalities. Mary and Martha in Luke 10. Mary sitting at Jesus’ feet while busy bee Martha is frazzled and distracted. The greatest possession is close fellowship with the Lord as our ‘portion’ in life, says the ESV Study Bible. “It will not be taken away from her” — neither now to help Martha in the kitchen, nor for all eternity. And Father said, stay at my feet, stay close, rest and trust Me. Instead of feeling like my mind is distracted and frazzled and busy like Martha, trying to please everyone and make the perfect choice. Jesus was a man who lived on this earth. He walked, talked, overcame, felt physical needs, spent time with other humans. He valued close fellowship with his Father. To experience him and learn about him and know him is transformative. God is cultivating in me a longing to know Jesus like I know my best friend or my husband. To wonder about him when doing mundane tasks. To imitate how he speaks to both friends and strangers. To prioritize life as he prioritized life. To learn how he responds well in tricky situations. To love him by my service. To listen to him. To learn his mannerisms and tendencies. To know his heart. I’m reading a book by John Eldredge called Beautiful Outlaw, about Jesus and his personality. All the quotes in this post are found in the book. It’s an interesting read. He woos, he confronts, he delivers, he heals, he shoots straight, and then he uses intrigue. He lives out before them the most compelling view of God, shows them an incredibly attractive holiness while shattering the religious glaze. I’m learning it this way… Holy Spirit is God in us; He is companion, wisdom, comfort, guide, and more. Jesus is our example for life; He lived a life that pleased God. Jesus is our brother to learn from. God is Father; He is creator, judge, powerful. The purpose of his life, death, and resurrection was to ransom you from your sin, deliver you from the clutches of evil, restore you to God – so that his personality and his life could heal and fill your personality. Your humanity, and your life. This is the reason he came. Anything else is religion. I sometimes underestimate the power of knowing Jesus as if he was a physical person in my life today. I sometimes underestimate the stories of the Bible.. passages that tell of his expressions, his words, his way of being, his view of the world. The purpose of his life, death, and resurrection was to ransom you from your sin, deliver you from the clutches of evil, restore you to God – so that his personality and his life could heal and fill your personality. Forgive me, Father. Thank you, for sending Jesus to live perfectly and die sacrificially.